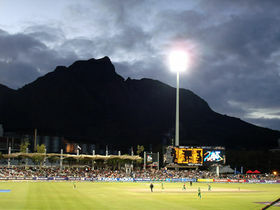 The 2007 ICC World Twenty20 was the inaugural Twenty20 International cricket world championship, contested in South Africa from 11 to 24 September 2007. Twelve teams took part in the thirteen-day tournament—the ten Test-playing nations and the finalists of the 2007 WCL Division One tournament: Kenya and Scotland. India won the tournament, beating Pakistan in the final. In case of a tie (i.e., both teams score exactly the same number of runs at the end of their respective innings), a bowl-out decided the winner. This was applicable in all stages of the tournament. The bowl-out was used to determine the result of only one game in this tournament – the Group D game between India and Pakistan on 14 September (scorecard). By finishing first and second in the 2007 WCL Division One, Kenya and Scotland qualified for the World Twenty20. The 12 participant teams were divided into four groups of three teams each. The groups were determined based on the rankings of the teams in Twenty20 as of 1 March 2007. The top two teams from each group went through to the second stage of the tournament. Group A saw the only exit of a seeded team when the West Indies were eliminated after losing both their matches. Their first loss came after Chris Gayle's record 117 runs was not enough to prevent South Africa from winning. Vernon Philander, Morne Morkel (both SA) and Ramnaresh Sarwan, Fidel Edwards (both WI) all made their T20I debuts. Chris Gayle became the first person to hit a century in an official Twenty20 International. He also scored the most sixes in one innings of Twenty20 with 10. The West Indian first-wicket partnership of 145 between Chris Gayle and Devon Smith was the highest in Twenty20 international cricket. The West Indies beat their own record of giving away the most extras in a Twenty20 match, with 28 (4 leg-byes, 23 wides and a no-ball). South Africa and Bangladesh qualified for the Super 8s as a result of this match. Group B started with World Champions Australia being defeated by Zimbabwe, Brendan Taylor scored 64 (not out) and saw the Africans home with one ball to spare. Tatenda Taibu, Vusi Sibanda, Tawanda Mupariwa (Zim) and Brad Hodge, Mitchell Johnson (both Aus) all made their T20I debuts. Luke Wright, Darren Maddy and Chris Schofield (Eng) all made their T20I debuts. Australia and England qualified for the Super 8s as a result of this match. In the first match Kenya scored the lowest Twenty20 International total of 73 against New Zealand and went on to lose with 12.2 overs and 9 wickets to spare. Kenya's fate was sealed when they allowed Sri Lanka to post a Twenty20 world record of 260 in the group's second match. Kenya were then bowled out for 88 and lost by a record 172 runs. Nehemiah Odhiambo, Maurice Ouma (Ken) and Chris Martin (cricketer), Daniel Vettori (NZ) all made their T20I debuts. Kenya's score of 73 all out was the lowest ever score in a Twenty20 International. Jehan Mubarak and Gayan Wijekoon (both SL) made their T20I debuts. Sri Lanka's score of 260 for six was the highest recorded in any top-level Twenty20 match. They also recorded the largest margin of victory in Twenty20 Internationals. Sri Lanka and New Zealand qualified for the Super 8s as a result of this match. India and Pakistan played in the first ever World Twenty20 bowl-out. India's bowlers defeated Pakistan 3–0. Scotland won the toss and elected to field first. This was Scotland's inaugural T20I match. Fraser Watts, Ryan Watson, Navdeep Poonia, Gavin Hamilton, Neil McCallum, Dougie Brown, Colin Smith, Majid Haq, Craig Wright, John Blain, Dewald Nel (Sco) all made their T20I debuts. This tournament's Super Eight format was designed such that the top 2 seeds from each group was pre-decided at the start of the tournament. The actual performance of the team in the Group Stage played no role in determining if the team qualified into Super Eight Group E or F. For example, in Group C, though Sri Lanka finished with more points than New Zealand, for the purpose of the Super Eight groupings, New Zealand retained the group's top seed position (C1) while Sri Lanka retained the group's second seed position (C2). In case a third-seeded team qualified ahead of the two top-seeded teams, it took on the seed of the eliminated team. This only happened in Group A, where Bangladesh (original seed A3) qualified ahead of West Indies (original seed A2) and therefore took on the A2 spot in Group F. The other seven top seeds qualified. The eight teams were divided into two groups of four teams each. The two top teams from each Super Eight group qualified for the semi-finals. Nathan McCullum (NZ) made his T20I debut. England eliminated and lost the chance to play the semis as a result of this match. Rohit Sharma, Joginder Sharma (Ind) and Chris Tremlett (Eng) made their T20I debuts. Yuvraj Singh scored the fastest fifty in an official Twenty20 International from just 12 deliveries faced (previous best was 20 balls by Mohammed Ashraful in the same tournament) and also became the fourth cricketer in all official forms of cricket and the first in Twenty20 to hit 6 sixes in an over. Stuart Broad was the bowler. This was the highest score against a Test team during the tournament. After three teams finished on equal points New Zealand and India advanced to the semi-finals by having higher net run rates. The hosts, South Africa, were eliminated as a result of this match. Brett Lee took the first ever hat-trick in a T20I match. Bangladesh was eliminated from the tournament. Australia qualified for the semi-finals as a result of this match. Sri Lanka was eliminated from the tournament. This was the first time a team chased a total in the tournament with all 10 wickets intact, making it the biggest margin of victory in terms of wickets. India won the toss and chose to bat on what was considered to be a traditionally batsman-friendly pitch at the Bullring. Umar Gul took the wickets of both Yuvraj Singh and Mahendra Singh Dhoni, leaving India with 157/5 in 20 overs; only Gautam Gambhir (75 from 54 balls) produced a notable innings. A 21-run over from Sreesanth swung the game towards Pakistan. However, Irfan Pathan (3–16) and Joginder Sharma (2–20) slowed the scoring dramatically. With Pakistan needing 54 from 24 balls, Misbah-ul-Haq hit 3 sixes off Harbhajan Singh in one over. Sreesanth was also dispatched for 2 sixes but took the wicket of Sohail Tanvir, as Pakistan went into the last over needing 13 runs to win, with only 1 wicket remaining. Joginder Sharma bowled a wide first ball, followed by a dot ball. Misbah followed by taking six off a full-toss; Pakistan needed just 6 runs to win from the last four balls. Misbah attempted to hit the next ball with a paddle-scoop over fine leg, but he only managed to sky the ball, and it was caught at short fine-leg by Sreesanth, leaving Pakistan all out for 152 runs. Irfan Pathan was awarded the Man of the Match for his spell, which included 3 wickets for 16 runs, including that of Man of the Series, Shahid Afridi. The umpires were selected from the Elite Panel of ICC Umpires and the ICC International umpire panel and the referees from the Panel of ICC Referees. ^ "T20 World Cup 2007". cricketwa. Retrieved 22 December 2015. ^ Soni, Paresh (24 September 2007). "ICC World Twenty20". BBC. Retrieved 24 September 2007. India beat Pakistan in the World Twenty20 final by five runs to clinch their first major trophy since 1983. ^ "Twenty20 WC: India, Pak in same group". Rediff.com. 13 June 2007. Archived from the original on 17 May 2009. Retrieved 2009-03-14. ^ "Twenty20 World Championship Schedule announced". SportsAustralia.com. 15 May 2007. Archived from the original on 17 May 2009. Retrieved 14 March 2009. ^ Veera, Sriram (16 September 2007). "Hayden and Lee power Australian win". ESPNcricinfo. Retrieved 28 March 2016. ^ "Arch rivals sight redemption in dream T20 final". AFP. 23 September 2007. Archived from the original on 14 November 2007. Retrieved 25 September 2007. With fellow master-blasters Dhoni and Pakistan's Shahid Afridi both due to take the field at the batsman-friendly Wanderers here, a sell-out crowd on what is a bank holiday in South Africa can expect another run-fest.